So far, I’ve told you about the recipe creators that will be participating in March Muffin Madness and I’ve told you about the fabulous grand prize giveaway. Now it’s time to get to an actual muffin recipe, which happens to be Paleo Chocolate Butternut Muffins today, and to our first daily giveaway! See the whole lineup of bloggers, blogs, and muffin recipes here. Be sure to leave a comment on today’s post to enter the grand prize giveaway that will be conducted on Wednesday, April 11, and includes a muffin pan, Gluten Detective test kits, NuNaturalsgift package, Legit Bread Company gift package, Elana’s Pantry gift package, $100 Amazon gift card, Instant Pot, Zojirushi breadmaker, KitchenAid 6-qt lift stand mixer, and—the grand prize!—Blendtec high-speed blender package! Please remember that EVERY comment in MMM (only one comment per post, please) will be an entry for the final giveaway, so if you’ve missed some posts, take a moment to visit each and leave a single comment so you’ll get the maximum entries in. Again, you can see a listing of all the posts here. I’m so happy to feature Tessa Simpson of Tessa the Domestic Diva for March Muffin Madness today. Tessa is well known for her delicious allergy-free, real food recipes in all categories. (You can read more about her and her family’s allergy-free story here.) Tessa does savory and sweet recipes equally well so you can easily make a whole meal using her recipes—and you should! 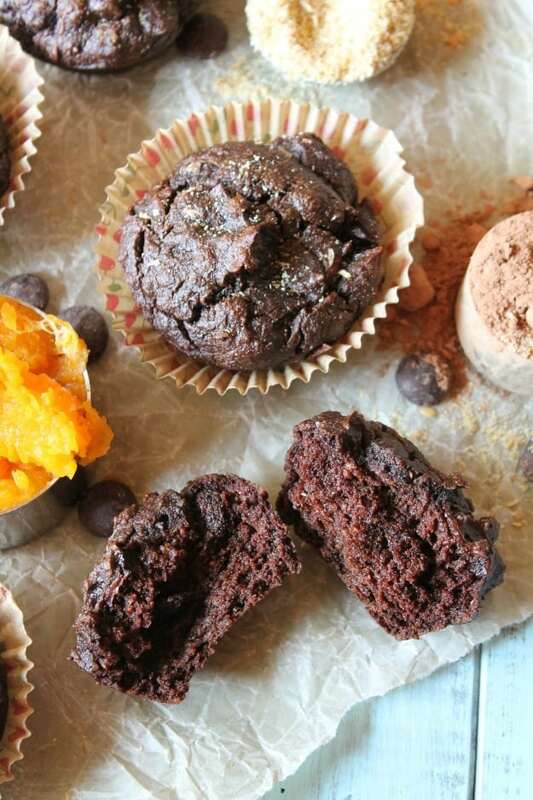 Tessa describes her Paleo Chocolate Butternut Muffins: “These sinfully rich and decadent muffins are a real treat! With a tender crumb, and brimming with nourishing ingredients, this is one muffin you’ll be happy to whip up and serve your loved ones!” I knew I wanted one of these scrumptious muffins after I saw the photos of them, but Tessa’s summary seals the deal! Preheat oven to 350F degrees and prepare a 12-cup muffin tin. In the bowl of a mixer, gently mix the squash, oil, and sugar. Make sure the squash is warm or room temp so the coconut oil does not harden. With the mixer running, add the baking soda and sea salt. Continue with the remaining ingredients. Let batter rest a minute or two to allow the flours to fully drink up the moisture. The mixture will be stiff. Put about ⅓ cup batter in each muffin tin. Bake for 15-18 minutes until just set and a knife comes out clean. *any pumpkin or sweet potato could be used, but consider that butternut squash is a drier squash, so you will need to adjust flour amounts IF you use a wetter (higher water content) squash or pumpkin. Sweet potato should function the same as butternut. Update: All the giveaways are now closed. Congratulations to the winners and thanks to all who participated! I can’t think of a better cookbook to feature as we kick off MMM as this event is always a celebration of so many things. My fellow gluten-free bloggers; you—my wonderful gfe readers; and fabulous gluten-free recipes, of course! The title of Danielle’s latest book describes its contents perfectly but if you’d like to know more about it, you can use Amazon’s “Look Inside” feature (on left side of Amazon page) and you can read my review here. See all 10 prizes here. Shown are the top six prizes (according to monetary value). Again, this giveaway is open to everyone, everywhere! « March Muffin Madness 2018: Who Will Be Sharing Muffin Recipes? These muffins look great! I would not have thought to use Butternut Squash! If I win, I would love the Celebrations cookbook! These muffins look delicious. I’d love the coconut sugar! Hey Shirley, Muffins are my weakness and i loved your idea of chocolate butternut muffin. Pictures are itself saying how exquisite it would be. Thanks for sharing with us. Love muffins! Amazing how well sweet potatoes work in muffins and breads. I have never tried butternut squash in them. I would like the coconut sugar if I win. Thanks for this chance to enter. Thanks for the great recipe, Shirley! My daughter needs something to take to a birthday party tomorrow and these are it!! As for the prize, that’s tough, but I think I’d like the coconut sugar please. SO EXCITED TO BACK AND PARTICIPATING AGAIN SHIRLEY!! Thanks for the the great opportunity! I love using butternut squash in recipes. These look yummy! I have some pureed butternut squash in the freezer that I’ll be defrosting & using for this delicious sounding recipe. I’d love the book. I am definitely going to try this recipe! I think my kids would love it too! Ooohh, we were planning to make muffins this weekend and I was staring at a brick of puree’d butternut squash in my freezer this morning and trying to decide what I wanted to do with it. Now I know! And these look SO good! These look good and I’m intrigued at using the squash! Unfortunately, due to allergies I can’t use it. can you use sweet potato Grace? The prizes all look so nice. I wuold enjoy getting any of them really, especially the mixer, blender or instant pot. Thanks for the give away. These muffins look really good too. Will have to try them. Love paleo recipes. These muffins look wonderful, will have to try. Any prize would be wonderful. I love Tessa’s recipes. Either the cookbook or coconut sugar would be fantastic! This would be a great addition to my slowly growing cookbook collection! Hmm… I think I have some squash in the freezer… I’d love to win Celebrations! Danielle is so great! The prizes are fantastic! Can’t wait to see more recipes! Thank you so much to all involved to present this! Oh yummy!! All of the recipes sound great! 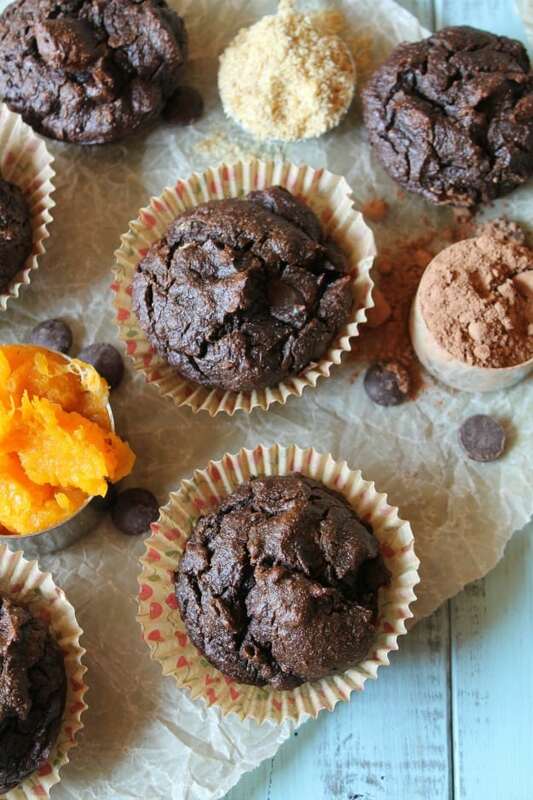 I would try the Paleo Chocolate Butternut Muffins recipe first! Thank you for the chance to win! Danielle’s Celebration cookbook sound wonderful. I happen to have some cooked sweet potatoes on hand so guess I’ll be making Chocolate Sweet Potato Muffins instead. Never would have thought to use squash (or sweet potato) quite like this. These look yummy. Adding to my recipe collection! 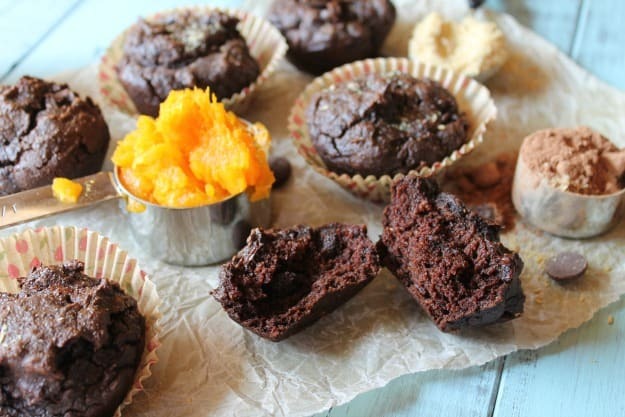 I love the use of the squash in this muffin recipe. Danielle’s cookbook would be amazing to add to my collection. New and exciting tools motivate me. Learning about how to be healthier keeps my momentum going.a new life and a new journey. I’d love to win! I’ve been GF for several years and paleo for about a year. Im bookmarking this recipe! Looks great! Would love the Celebrations cookbook to help teach my young daughters, 3 and 7, there are amazing recipes available for a gluten free, dairy free lifestyle. Yum!! This recipe and cookbook look amazing!! I’d choose the cookbook. The muffins look great! I’ve never thought of putting butternut squash in a muffin, brilliant! I’d love to win the cookbook! To hard to pick they both are fabulous. 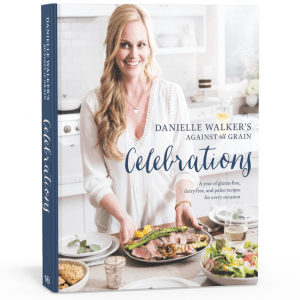 I would love to get Danielle Walker’s Against All Grain Celebrations: A Year of Gluten-Free, Dairy-Free, and Paleo Recipes for Every Occasion. love the idea of using butternut! I’m curious to try these. These muffins look spectacular, and I’d love to celebrate with Danielle Walker! 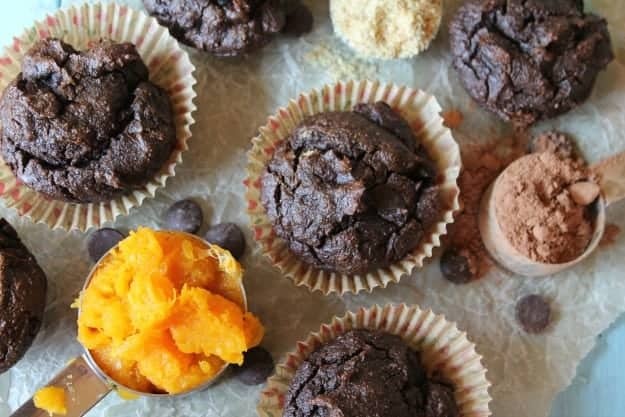 Your March muffin madness is so fun and putting butternut squash in muffins sounds awesome!it would be great to win Danielle Walker’s celebrations book. Very clever use of butternut squash! Thanks for the opportunity to win that Blendtec, as well. These muffins look fabulous! I’d like the celebration cookbook to expand my healthy cooking repertoire! I would love to try the sugar! CAn’t wait to try the recipe. Yummy! I love anything chocolate! These muffins look amazing Tessa! The texture looks deliciously soft and fluffy. 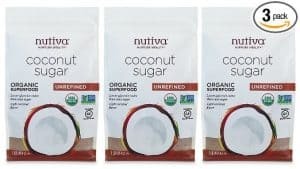 I would love to win the coconut sugar because I’ve never tried it before! I can’t wit to try these muffins! I’d love to have this cookbook by Danielle! Navigating special occasions is so difficult for eating allergy free, but yet delicious foods. Winning this prize would be great. I love having coconut sugar in my pantry for baking and to sweeten tea. I’m actually almost out. Winning this prize would be fantastic! The muffins look delicious and I am anxious to try the recipe. Danielle’s cookbook would be a great resource as I learn all the tricks of giving up grains in my diet. Thank you for the opportunity to be a winner! Wow, I love baking with different ingredients and these aound great! Thanks for the recipe. I bake for my family almost everyday, always looking for new recipes!